The 2.63 acres is perfectly located to enjoy the 40 acres of ascending tree tops on the neighboring 25 acre Hicks and 15 acre Phillips estates both of which adjoin President George and Laura Bush’s Mayflower estate home. 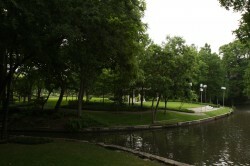 The property is spread along 460 feet of a spring fed creek and small lake. Views of a 10 acre private garden across the creek enhance the tranquility and privacy of this site. The incredible width of this estate property allows ample room for a tennis court adjacent to the 3,800 square foot Nick Glazbrook designed guest house. A large swimming pool, terraces, gardens, mature trees, rugged ravine, broad grass meanderings along the creek and small lake which relate visually to the beautiful garden views of the adjacent estate properties. 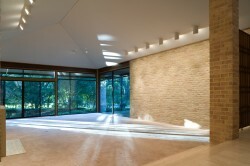 Architect Scott Lyons designed what is considered one of the most important and well built modern homes found in Dallas. This 9,902 square foot modern residence and 3,800 square foot guest house is a very private and aesthetically pleasing expression of an indigenous Texas style. It is a home of quality, built with extraordinary materials and engineering and has beautiful views of land, trees, a creek and a lake. It includes the primary residence, three-car garage and pool on 1.4 acres and a separate guest house on the adjoining 1.23 acres. Now that you have developed a spectacular museum quality collection of art, here is the opportunity to acquire an architect designed home perfect for this work in a visually enticing environment ideal for your outdoor sculpture. 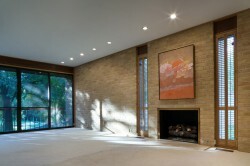 The interior space is also perfect for your collection of art. The ceilings are tall, walls of windows allow voluminous rooms to be filled with light, continuous interior and exterior walls of soft Mexican brick reflect the region, cross-cut white oak panels add warmth to the rooms and white gallery walls are ideal for your vibrant collection. 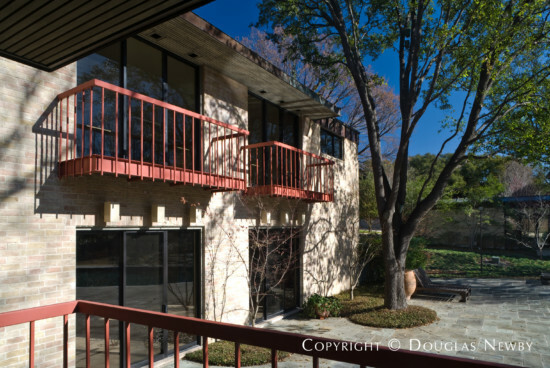 David Williams and O’Neil Ford established Texas modern architecture to create a modern style that reflects the pioneer homes of Texas, which they considered as modern as the modern homes of the great European architects. They wanted to create a modern style for Texas in the same way Frank Lloyd Wright created a modern style for the Midwest. They succeeded. They oriented houses to capture the cool breezes coming from the southeast. Scott Lyons did the same with this Texas modern home, orienting the house with large windows and sliding glass doors that will allow summer breezes to pass through the 50 acres of trees of the two estate properties to the southeast, the Hicks and Phillips estates. Homes were traditionally protected from the harsh afternoon sun while the morning sunlight and low winter sun is invited into the home. 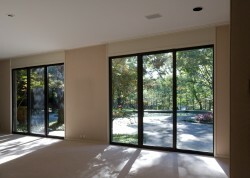 Here, tall narrow windows are used on the west side of the home; wide expanses of glass are used on the south side of the home. Continuous exterior and interior soft Mexican brick walls are only divided by walls of glass. A standing-seam metal roof reflects Texas and is energy efficient and kind to the environment. Every few years a great Texas modern home becomes available. 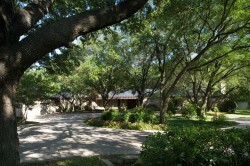 Here is a home designed by the great Texas modern architect of his era. Scott Lyons is an architect who worked with O’Neil Ford and continued exploring the same architectural themes when he established his own firm. 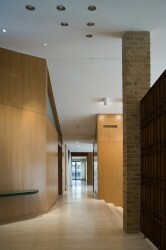 After O’Neil Ford and before Frank Welch, Scott Lyons designed many of the most important homes in the Texas modern style using indigenous materials, balconies, terraces, continuous brick walls, walls of windows and designs that were aware of and took advantage of the environment and the site. Eugene and Margaret McDermott hired him to design both their Highland Park home and their country house in Allen. 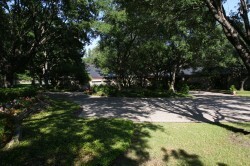 Scott Lyons also designed the home for Mr. and Mrs. Dan Williams overlooking the Creek at St. Johns. His architecture works beautifully with the period masterpieces and contemporary art found in the homes he designed. This home is well-designed, visually very quiet, and extremely unassuming from the street. The one-story house with a standing-seam metal roof sits down from the street and in the best of Texas traditions blends into the landscape. The front façade of this brick home has very few windows which adds to the modesty and privacy of the home. The rear façade is almost entirely floor to ceiling windows, illuminating the home with morning and early afternoon sunlight. You will see the timeless style and durability of materials throughout the home. This estate home is not opulent, but exudes quality and grace. The homes on both sides and across the street are also architect designed period homes that blend into the landscape rather than tower over it, providing a pleasing rather than imposing environment. This home is on Gaywood Road, a street with very little traffic as it loops around from Walnut Hill and ends at Meaders. Except for use by residents, it is a little traveled street because it really doesn’t lead anywhere. 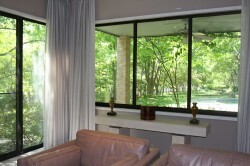 There are very few windows on the public side of the house with the rear façade made up of almost all windows, glass doors, and glazed openings with very private views of extensive land, trees, creek, lake and the 10 acres of a private garden which is part of the 20 acre estate on the other side of the creek. While this contemporary residence is tucked away on a hidden and bucolic street, it is only a couple of long blocks away from the Toll Road at Walnut Hill Lane. Whether you are stopping by Border’s Books at Preston and Royal or going to Highland Park Village or to the office downtown, this home is conveniently located, protected and well away from noise and traffic, but within easy access to all the important roads. The main home is 9,902 square feet. It can be functionally separated into multiple spaces. The main living area is the 5,096 square foot one-story space that includes the master bedroom with separate bathrooms and large walk-in closets, two other large bedrooms and baths, a significant living area, beautifully finished study, formal dining room, kitchen, breakfast room, utility room and break area for staff. The two-story guest and recreation wing of home includes in its 4,320 square feet a lavish guest suite along with another bedroom and bathroom, very large living areas on both floors overlooking the pool facilitated by walls of glass opening to balconies on the second floor and opening to the pool terrace on the first floor. A large sauna bathroom with shower and bath on the first floor is easily accessible to the pool and exercise room. A beautifully finished 420 square foot private conference room is found below ground level. A media room is positioned next to the first floor living area. The two-story guest house was designed by Nick Glazbrook, AIA, who does work in the style of Scott Lyons and Frank Welch. 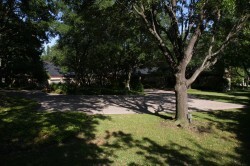 It has its own driveway from the street and a two-car garage with a full bath. This home is also surrounded by windows with enviable views of the creek, tall trees and expansive gardens. A lavish master bedroom suite is on the second floor. The home is already set up with an office, study, and gracious meeting rooms and living areas. There are two and one-half bathrooms on the first floor, convenient to the pool. There is a gourmet kitchen and laundry area. This property is being offered for sale at a great value, very near the land value. You will acquire a home that would cost at least $400 per square foot to build at virtually no additional cost. You will not find a property of this quality near the price in Highland Park or Preston Hollow.